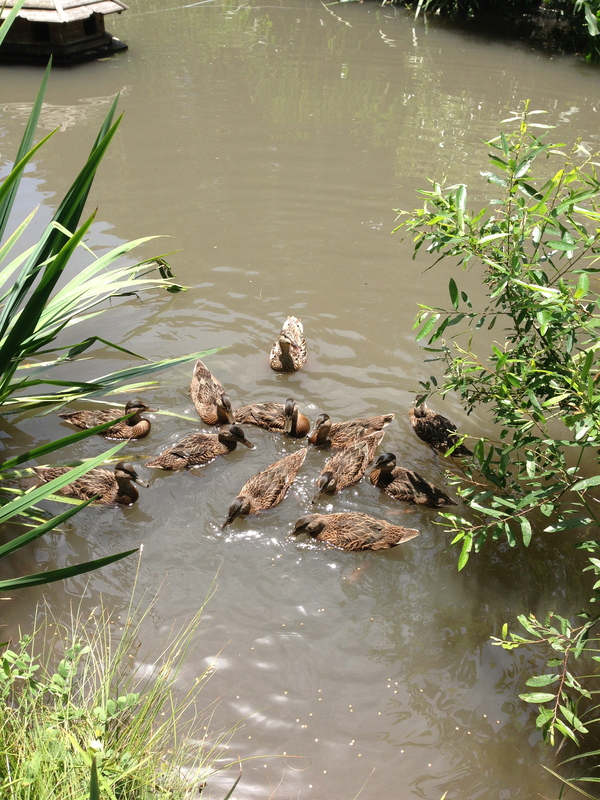 You are here: Home / Blog / Quick duckling progress story!!! First ducklings of the Spring! I just returned from a walk to Beacon Hill Park here in Victoria, British Columbia, where I enjoyed all the ducks and their ducklings swimming in the park’s many ponds. Our ducklings are quite a bit further behind yours, though, and look more like the tiny fluff balls in your first picture! Penelope how darling, there are ducks in the ponds here in the neighborhood, mostly geese though. Beautiful…………..you are very lucky INDEED! Beautiful post on you over at PATINA FARM TOO! Did you find the Penelope rose?I must go get one or THREE! and God Bless you & Adam! I never thought that ducks grew so fast, with almost 2 months and they are almost the same size as their mom. and they still cannot fly! when the feathers on the ends of their wings cross…..they can fly! Because of the houses floating (and tethered on the pond) the predators cannot get to them! I scare off the winged ones! (hawks and Great Blue herons)! The houses shelter them from the owls and night-time predators……raccoons, bobcats, coyotes, skunks, and various others. They hear me walking on the gravel…..and they scurry to the side. I have to stop myself from naming them! They are such beautiful birds. They all look the same…..for the first 6 months ! Camouflage done beautifully! and they do recognize my voice! (many generations!!) It is quite amazing!! Thank you for this, Penelope. My goodness there is so much beauty in the world. I love that you appreciate it so.